University of Houston Law Center LL.M. Program - Health Law LL.M. 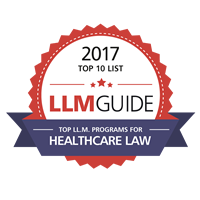 The Law Center’s Health Law & Policy Institute is recognized among the top health law programs in the United States. The faculty of the Institute govern the LL.M. program in health law, which emphasizes interdisciplinary studies in all areas of health law and policy. Established in 1978, the Health Law & Policy Institute has advanced the understanding of health law issues and provided guidance for significant policy decisions affecting every element of health care. The Institute sponsors curriculum, teaching, research, publications, and conference activities relating to health law and policy activities. The Institute is known for its associations with academic and health institutions locally, across the United States, and around the world. An advisory board of leading academicians, practitioners, elected officials, community leaders, and health care executives assist in these collaborations. Health Law LL.M. students are encouraged to take active roles in Institute activities, including assisting with academic publications such as the Houston Journal of Health Law & Policy. The Institute maintains close relationships with institutions throughout the nearby Texas Medical Center, where ready access to the world’s largest medical complex adds an important dimension to the LL.M. program at the Law Center. The Health Law LL.M. program gives attorneys an opportunity to return to an academic setting to obtain specialized training or to update their knowledge in health law. Health law courses previously taken at the UH Law Center or at another institution may not be credited toward program requirements. Students must complete a minimum of 18 credit hours in health law courses. * Not all classes are offered every year, and offerings are subject to change. Please check the Law Center website for current course offerings. Lawyers who earned their degree outside of the United States are also required to complete Introduction to American Law and Legal Research and Writing. Courses previously taken at other schools – including the Law Center – may not be credited toward the program requirements.